I dance myself to sleep : for piano (Variations on an old love theme) / Joseph Twist. Sleeping has long been a fascinating and frustrating activity for me. I am a very light sleeper, if not a frequent insomniac, and when I do sleep I often have bizarre and surreal dreams - which I assume most of us experience at some point. Sleeping is a mysterious activity; a strange altered state of consciousness that may involve sleepwalking, nightmares and fantasies, while also being an essential part of living, providing rejuvenation, relaxation, escape and peace. The power of sleep may go further; as Walt Whitman suggested, sleep is a democratising force - even murderers sleep like the rest of us, young and old, black and white. Score [ePDF]: I dance myself to sleep : for piano (Variations on an old love theme) [eScore] / Joseph Twist. 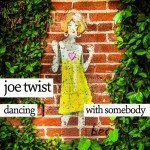 CD: Dancing with somebody / Joe Twist.